Move over, Serena! 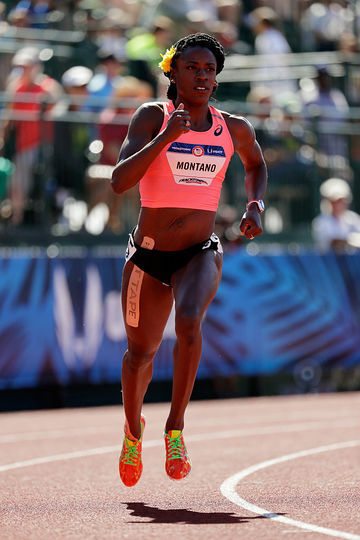 Olympian Alysia Montano is more proof that pregnant athletes (and preggos in general!) are badass. Serena Williams made headlines a couple of months ago when the world found out she was in her first trimester when she won the Australian Open in January. And she just amazed us again with an Instagram clip of her playing tennis at eight months pregnant! Now another female athlete is helping to normalize physical activity in pregnancy—runner Alysia Montano, who will race in the USATF Outdoor Championships' first round of the 800m this week in Sacramento. The 2012 Olympian announced her pregnancy in April with a super-cute video featuring her husband and her two-and-a-half year old daughter, Linnea, running alongside her to the theme from the movie Chariots of Fire, and winning medals that read "proud papa," "pregnant" and "big sister." Montano's second child is due in November, so she will be racing while about halfway through her pregnancy. This isn't the first time Montano has raced while expecting. In 2014, she also ran in the nationals at Sacramento—while eight months preggo! Wow, that's dedication to your sport. Montano said she talked with her doctors about running throughout her first pregnancy, and they gave it the OK. Her doctors' support "took away any fear about what the outside world might think of a woman running in pregnancy, or just exercising in general," Montano said after the race. "What I found out is that exercising during pregnancy is actually much better for the mom and for the baby." So true! Montano said she just wanted to do what she normally does, which is why she chose to run her first race while pregnant. "I didn't want to be judged or have any ill things said about me—I just wanted to do what my heart and my desire wanted me to do," she said in the post-race interview. "I wanted to celebrate that I made it 34 weeks and have been able to stay fit and healthy, and empower women to see how amazing the female body really is." Many people still look at pregnant women as delicate, but we know it takes an awful lot of strength to grow a baby. And the healthier you are while pregnant, the easier it will be. Doctors don't advise you to start up a strenuous new fitness regimen after becoming pregnant, but you can continue doing what you were doing before if your doctor gives you the green light. And if you're Alysia Montano, that means competing as a runner. "This is what it looks like to be a professional athlete as a woman and still continuing on your career," she said. What an amazing role model for all moms!